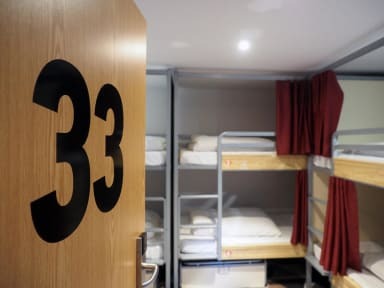 Our Liverpool Street hostel is the newest of our London hostels, built only in 2017. Just a stroll away from London’s coolest neighbourhood Shoreditch, we’re perfectly located if you’re looking for a fun mix of young locals, businessmen and partying travellers. Wake up surrounded by skyscrapers with The Gherkin on your doorstep, plus you’ll only be a 5 minute walk from Moorgate AND Liverpool Street tube stations. We’re set right above a traditional and charming British pub, where our guests can enjoy breakfast in the morning for just £4. 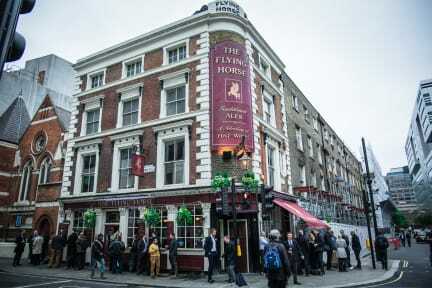 You won’t have to wander far before you reach Shoreditch and its abundance of amazing rooftop bars, the famous street art of Brick Lane and the awesome Old Spitalfields Market street food stalls. There’s no place better to base yourself than in London’s most bustling neighbourhood. A proper place that is relatively cheap, especially in the (financial) area. Shared toilets and showers outside the dorm, a small tap, basin and mirror inside the room. There currently (april 2018) are constructions on the building next door, but the noise isn't even that bad. Conveniently close to Liverpool Street station, especially easy if you get there by train from your airport.